Méchoui is the North African version, in spirit at least, of a Carolina pig pickin’—a community feast centered around a whole lamb seasoned with a paste of pungent spices, then roasted crackling crisp in a fire pit or on a spit. That’s the inspiration for the ribs here, although I’m not sure this exact recipe has ever been served in Morocco. In keeping with the North African theme, the lamb is served with harissa, a spicy hot sauce. Step 1: Place the onion, garlic, ginger, paprika, salt, pepper, coriander, cinnamon, and cardamom in a food processor fitted with a metal chopping blade. Run the machine in short bursts until a coarse paste forms. With the motor running, add the lemon zest, lemon juice, and enough olive oil to obtain a paste the consistency of mayonnaise. Taste for seasoning, adding more salt and/or lemon juice as necessary; the spice paste should be highly seasoned (you’ll have about 1 cup). Step 2: Prepare the ribs: Place a rack of ribs meat side down on a baking sheet. Remove the thin, papery membrane from the back of the rack by inserting a slender implement, such as a butter knife or the tip of a meat thermometer, under it. The best place to start is on one of the middle bones. Using a dishcloth, paper towel, or pliers to gain a secure grip, peel off the membrane. Repeat with the remaining rack. Step 3: Using a rubber spatula, spread each side of the ribs with the spice paste. Cover the ribs with plastic wrap and refrigerate until ready to grill. The ribs will be good cooked right away, better if marinated for 2 hours, and spectacular if marinated overnight. Step 4: Thread the ribs onto the rotisserie spit: Place a rack of ribs bone side up on a work surface. Using a sharp, slender knife, make starter holes in the center of the meat between every 4 or 5 ribs. Twist the knife blade to widen the holes; this will make it easier to insert the spit. Repeat with the remaining rack of ribs. Use an over and under weaving motion to thread the spit through the holes in the racks of ribs. Step 5: Set up the grill for spit roasting following the manufacturer’s instructions and preheat to high. If you are cooking on a charcoal grill, use the Mississippi test to check the heat. Place a large drip pan in the center of the grill directly under the spit. Step 6: When ready to cook, attach the spit to the rotisserie mechanism, turn on the motor, and cover the grill. Cook the ribs until they are golden brown and cooked through, 30 to 45 minutes. 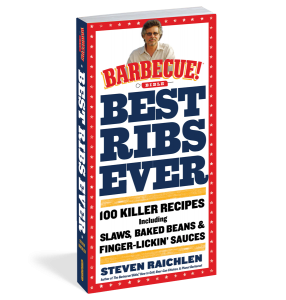 When the ribs are done, the meat will have shrunk back from the ends of the bones by about ¼ inch. Step 7: Transfer the spit with the ribs to a cutting board. Carefully remove the skewer, then let the ribs rest for a few minutes. Serve the racks, whole or cut into individual ribs, with the Harissa and lemon wedges. If you don’t have a rotisserie, you can grill the ribs on a gas or charcoal grill using the indirect method. The cooking time will be 40 minutes to an hour at medium-high (400 °F).